thousands of people around the world for fitness, health, vitality & stress management. Qigong Healing is a related Chinese Medicinal art, very useful in cardiovascular disorders, diabetes, Asthama, High Blood pressure, Hyper Cholesterolemia, Joint problems. Then CLICK ON THE BELOW LINK. Tai chi is a Chinese martial art that is primarily practiced for its health benefits including a means for dealing with tension and stress. Tai chi emphasizes complete relaxation, and is essentially a form of meditation, or what has been called &meditation in motion Unlike the hard martial arts, tai chi is characterized by soft, slow, flowing movements that emphasize force, rather than brute strength. WHAT IS EXECUTIVE TAI CHI? Today, These steps are learnt without understanding the basic meaning and application of each move. After a while, Students get bored of the slow pace and complicated movements and eventually give up. Until now, original Chinese Tai Chi was difficult to learn with its complicated steps practiced primarily for self defense. Now, after a ten year extensive research by a group of young Doctors, Tai Chi has been condensed into a Fitness n Health science called Executive Tai Chi . We absorbed the useful movements and discarded the complicated joint straining movements. We converted the usuall Tai Chi Chuan into a user friendly, fast to learn method for today’s busy, stressed out metro man. This method involves no acrobatics, requires no great flexibility and teaches no complicated steps or no knee straining stances or positions. We added a Cardio workout, added Music, added a unique Pot belly reducing chinese program, added Pranayama & Chinese Meditation. We now present EXECUTIVE TAI CHI, the most happening fitness system in Asia. This method is simple, and meant for men, ladies, children, girls, pregnant women and elderly. It will be beneficial to the healthy and the diseased. 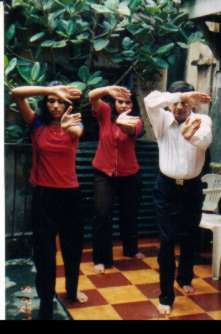 Cardiac patients, Stroke patients and Chronically disabled patients will also benefit greatly from this form of Tai Chi. Learn to use Tai Chi for fighting, in Combat, & as a Martial art. Contact Us for Details - We will outline a program that best suits your needs. 3. Flexible hours from 7am to 7pm, One hour sessions twice weekly. For working people, sessions can be held before or after office hours. 4. Personalized training & attention, small group of max three students per session. 7. Workouts: Here Tai Chi is no longer slow & monotonous, but fast paced enjoyable, & fun to upbeat music. (Remember correct Tai Chi is both Ying (slow) and Yang (fast), to attain a balance in Life (Tao). 8. Certificates on succesful completion of every course. 10. Courses are easy, educative & fun!